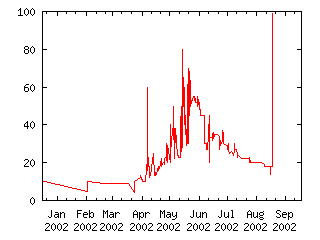 During the year 2002, at least one contract of T2007 will trade at a price below 90. This claim aims to test whether creating additional derivative claims will substantially affect the trading of the underlying instrument. It also tests whether the liquidity of idea futures will support the trading of idea derivatives. This claim is unambiquous. If at any time there is a trade at a price of 89 or less on the fx ticker showing a year of 2002, it will be immediately judged true and pay each yes coupon 1. If there is no trade at a price of 89 or less with a date on the fx ticker showing a year of 2002 the claim will be judged false and pay each no coupon 1.